ORLANDO, Fla., May 25, 2016 – Lockheed Martin (NYSE: LMT) recognized 19 small business suppliers, out of thousands from across the nation, who have made extraordinary contributions to the Missiles and Fire Control business area’s products and services. For more than 20 years, Lockheed Martin has annually celebrated small business suppliers providing quality goods and services, and outstanding support. The Bernd Group earned ISO 9001 certification for the 13th year. This certification will extend until Sept. 2018 and includes a scheduled surveillance audit for October 2016. TBG completed a two day surveillance audit in February 2015 with zero findings and concluded their recertification in October 2015 with a 3.5 day audit. The Bernd Group looks forward to transitioning to the 2015 ISO standard and reaping the benefits the new standard brings to the organization. 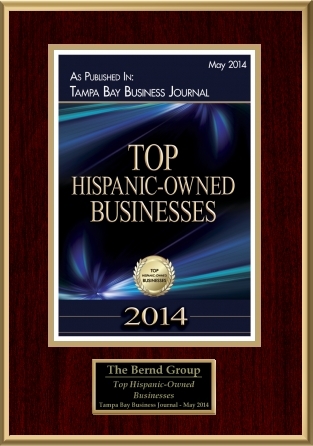 For more information about The Bernd Group, please contact Buffy Mitchell, communications@berndgroup.com. 2016 is the 8th year The Bernd Group operates as an ACE GOLD Supplier. TBG completed an ACE Gold Recertification audit in December 2014 and presented “homework” to our Pratt & Whitney ACE Client Managers (ACM) in early 2015. The Bernd Group received notification of its ACE Gold Recertification in August of 2015. TBG continues to present ACE projects on a quarterly basis to our ACMs. EAST HARTFORD, CT, APRIL 22, 2014 –The Bernd Group was presented Pratt & Whitney’s 2013 Minority Business Enterprise Excellence Award during a ceremony held at United Technologies Research Center Auditorium. Award nominees were selected by several Pratt & Whitney business units and The Bernd Group received this distinction for their Durable Tooling Center of Excellence and their exemplary execution of services. During the award presentation, Alton Moss, Pratt & Whitney Supplier Diversity Manager, recognized The Bernd Group’s Durable Tooling Center of Excellence. Moss commended The Bernd Group for reducing delays and for streamlining the procurement process through continuous improvement and their commitment to the ACE quality program. Sam Abdelmalek, UTC VP Global Supply Management and Integration, provided the ceremony’s closing remarks during which he urged other suppliers to become a UTC Gold Supplier like The Bernd Group. In her acceptance speech, Pilar Bernd, President of The Bernd Group, thanked other Pratt & Whitney champions of The Bernd Group including Mr. Bob Stubbs and Mr. Steve Schwink. Other distinguished presenters at the award ceremony included Jill Albertelli, Pratt and Whitney Vice President, Supply Management, and Captain Michael Beaulieu, Commander, DCMA Aircraft Propulsion Operations. Dunedin, FL, August 20, 2013 – The Bernd Group was designated the 2012 Minority Supplier Distributor of the Year by the Minority Business Development Agency (MBDA) at the Central & North Florida Minority Supplier Development Council’s 30th Annual Business Opportunity Fair & Conference in Lake Buena Vista, FL, August 7-10, 2013. The Minority Supplier Distributor of the Year Award is given to the minority company that has achieved exceptional success in both the domestic and international markets. Accepting the award on her company’s behalf, Pilar Bernd, President of The Bernd Group, also received a surprise honor when she was presented with the Lorian Williams Award. This humanitarian award is presented to a council member who is dedicated to the cause of minority business development and who has significantly impacted the council and their community. The annual awards ceremony was held August 8, 2013 in the Grand Ballroom of the Contemporary Resort. Corporate members and Minority Business Entrepreneurs (MBEs) of the CNFMSDC were eligible for nomination. Nominees were selected by a representation of the more than 200 major corporate members of the CNFMSDC including Walt Disney World Resorts, Lockheed Martin Corp., Darden Restaurants, and Office Depot. An affiliate of the nation’s largest minority business development organization, the CNFMSDC helps its members achieve their supplier diversity goals. Founded in 1980, the privately funded group provides a direct link between corporate America and minority-owned businesses. It is the only ISO 9001-2000 Certified Council in the NMSDC Network and hosts the largest MBE trade fair in the Southeast United States. Founded in 1989 by Pilar Bernd as a wholesale distributor of industrial equipment, The Bernd Group expanded its services to specialize in supply chain management largely for the aerospace and defense industry. The Bernd Group has been certified as an ISO 9001:2008 Supply Chain Management Specialist since 2003 and became an ACE Gold Supplier for United Technologies in 2008. The Bernd Group currently employs 68 outstanding individuals dedicated to supporting their customer’s world-class supply chain procurement departments.